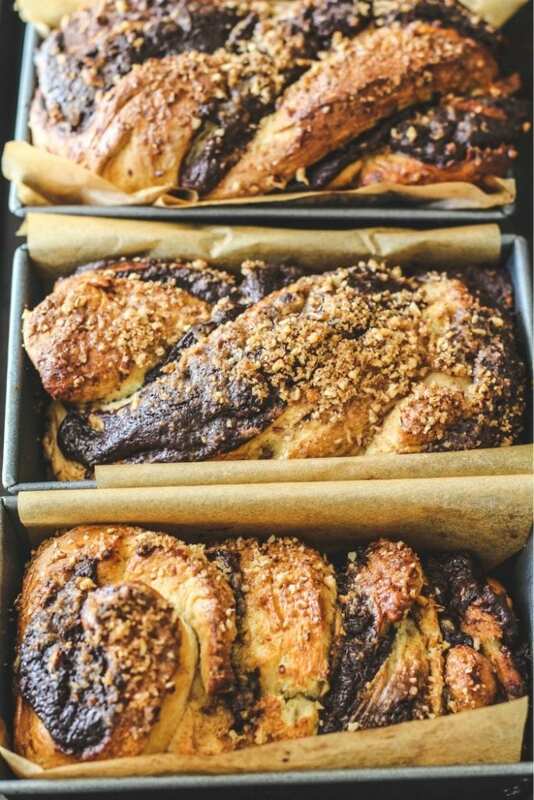 This Chocolate Babka is a soft and fluffy yeast dough just bursting with chocolate. It makes the most perfect breakfast with a hot cup of coffee or even dessert. It’s a work of love and is a family favorite. There was a time when I was baking at least one different bread every month for my family and even friends. There was so much bread baking happening it seemed as if it would be better to just open a bakery! There was a handful of times I even made a chocolate babka. 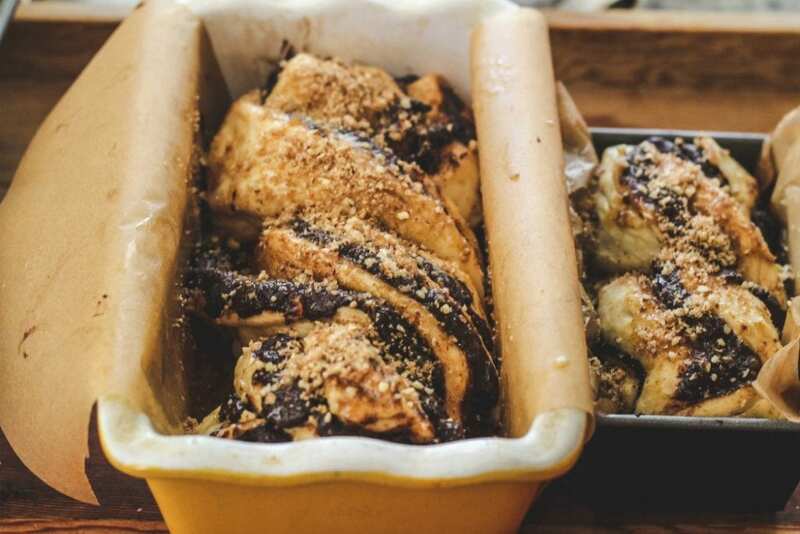 A chocolate babka is no easy feat to tackle! It’s not that it’s impossible. It is time consuming and it can get a little messy when you’re spreading the chocolate filling and rolling it. I do include some babka step by step photos to help you. I was intending to share my first yeast bread of the year as something from a not so famous region of Italy. It is a bread from Alto Adige, Italy: Nusszopf al Cioccolato). A Nusszopf or Treccia alle Noci in the Alto Adige region of Italy is made with walnuts or hazelnuts. I have even come across a Nusszopf al Cioccolato and it has cocoa powder, ground nuts and cinnamon. SO which way do I go with the name of this bread? I’ll just stick with a babka as it seems everyone will be more likely to know what it is. And when the bread was ready my kids came into the kitchen all excited, “You made BABKA!”. 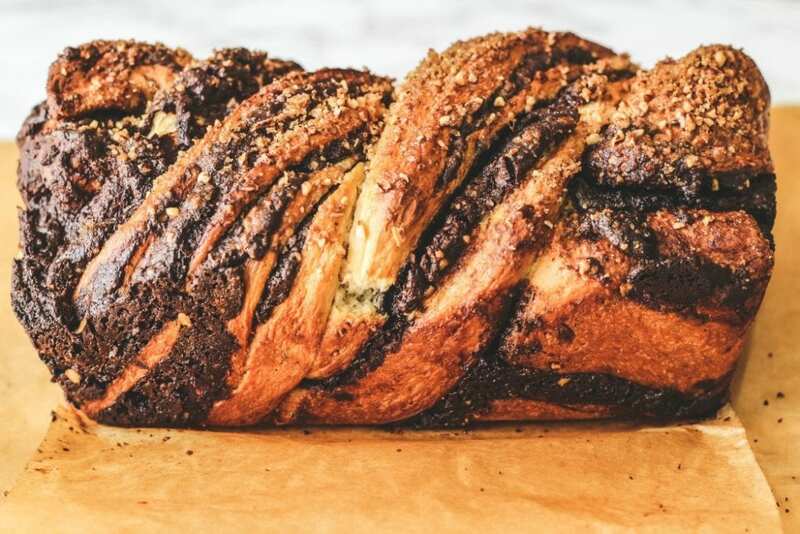 It’s so common now that I even see babkas at Trader Joe’s and at Publix. 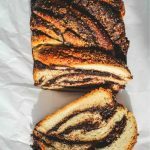 Babka means little grandmother or piccola nonna in Italian. The Eastern European Jewish grandmothers would make this bread with the scraps from challah bread. 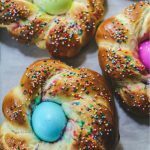 I’ve come across babkas all over the internet and even on blogs from Italy. For my Italian peeps, we can call this a Babka al Cioccolato. I suppose it’s everywhere because Bon Appetit last year declared it the new bagel. 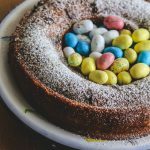 The Jewish baking goddess Marcy Goldman said about babka…”Variations or derivatives of it are everywhere: Greek Easter Breads, Italian panettone and Russian kulich.” I found it interesting that she feels that a panettone is a variation or derivative of a babka. She also mentions that babka derives from babcia, which in Polish means grandmother. I like to think of it is piccola nonna (little grandmother)and imagine her making this every week for her grandkids. She also thinks that this is a hybrid of the French pain au chocolat. She also talks about the famous Cheskie bakery babka that sells by the chunk and it’s $6 a pound (wow!). I made something similar to this one time back in 2013 (my Mexican Hot Chocolate Bread)and it had a little kick from the cayenne that I added to the chocolate. The dough is a very soft brioche type of a dough. It has eggs, margarine (or butter) and milk (I used hazelnut milk)and is very easy to work with.As for the chocolate spread, the last time I made this I did use Nutella and it was wonderful to work with. Sort of like spreading a very sweet chocolate frosting on the dough. I made my own chocolate filling and it was less sweet. I happened to have about a cup of ground pecans, cinnamon and sugar on hand leftover from this cake’s topping. Feel free to omit that from the recipe if you don’t have pecans or don’t want the extra sweetness. If you do have pecans on hand (even ground walnuts or hazelnuts would work fine as it goes to what I was mentioning above about the bread from Alto Adige in Italy. Since we have a diary free family member, this dough is actually dairy free. I made it with vegan margarine and a hazelnut milk instead of regular milk. It still turned out fantastic (just minus the buttery flavor)! Feel free to use butter and your favorite milk when you make it. HOW LONG DOES A BABKA STAY FRESH? Babka will stay fresh for 24 hours in an airtight container at room temperature. Be sure not to store your babka in the refrigerator. You may be wondering if you could freeze that 2nd babka. YES! The Babka freezes well for up to 2 months. You can thaw it on the counter wrapped or even in the refrigerator. Twelve Loaves: I used to do a monthly bread baking challenge called Twelve Loaves. It was launched back in May, 2012 (wow!! Time flies!!). It was filled with wonderful bakers from all over the world and we would bake along to a different theme. The baking group always inspired me to bake bread. So to get myself baking a different bread here every month, I am starting Twelve Loaves again for myself. My goal is to bake Twelve Loaves by the end of 2019. I hope you follow along to see my breads!! Here is my first bread of the year: Chocolate Babka-Babka al Cioccolato. 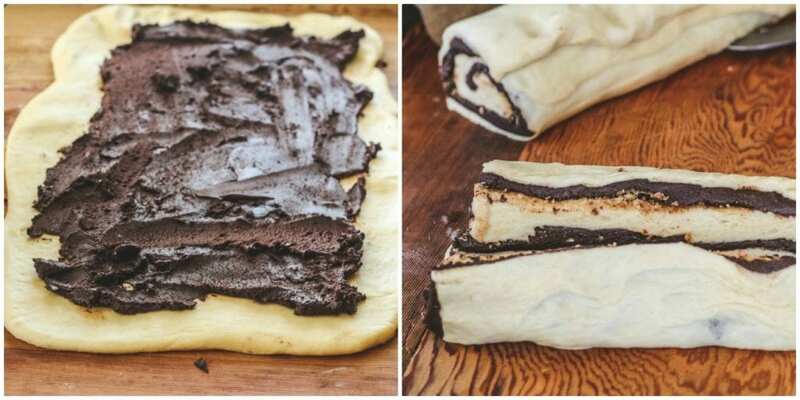 Some step by step photos of how to make a chocolate babka. Here is my dough after rising for a couple of hours. 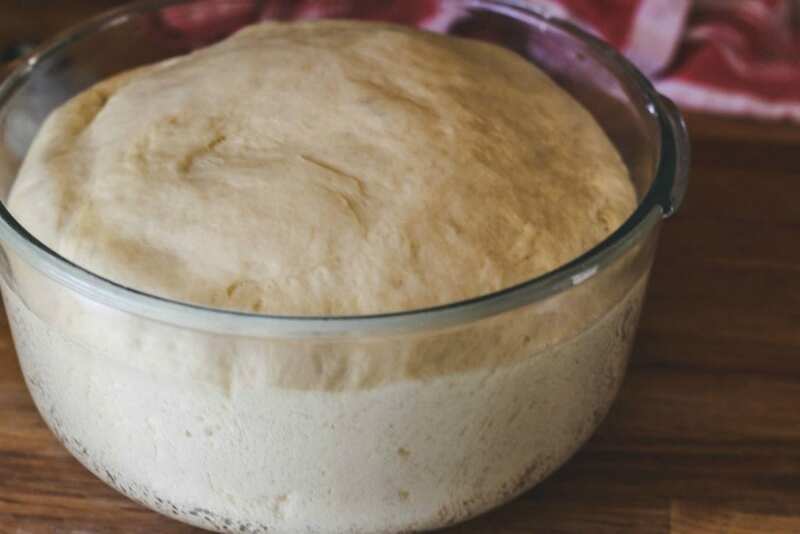 The warmer your room, the easier it will be for the dough to get a good rise. I did not roll my dough paper thin. I rolled it out to about 10×18 rectangle. This is enough dough to make two loaves that fit in a loaf pan or one regular size loaf and 4 mini loaves. Here is my dough with even my pecan cinnamon sugar mixture sprinkled on the chocolate. Not a necessary addition but quite a delicious one!! The chocolate is like a thick fudge. It’s easier to spread as soon as you mix the sugar and cocoa powder with the melted margarine (or butter if you’re using that)and the the melted chocolate. The more it sits out the harder it gets. 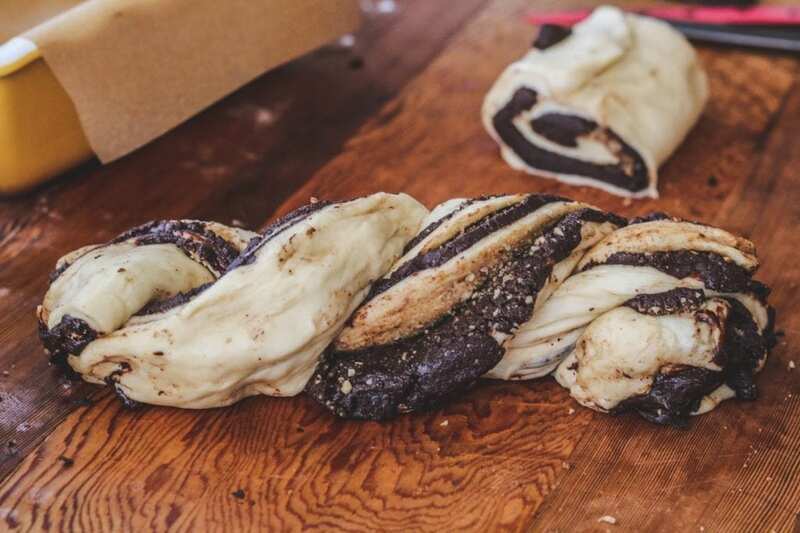 I’ve seen some babkas twisted over twice. There is no way my babka could do a double twist. It was ready with just one twist of the two portions of filled dough. It maybe doesn’t look so pretty at first when you put in the loaf pan, but after you let it rise a little, it shapes up. I just let leave it covered while the oven is heating up. It didn’t need to rise more than that. 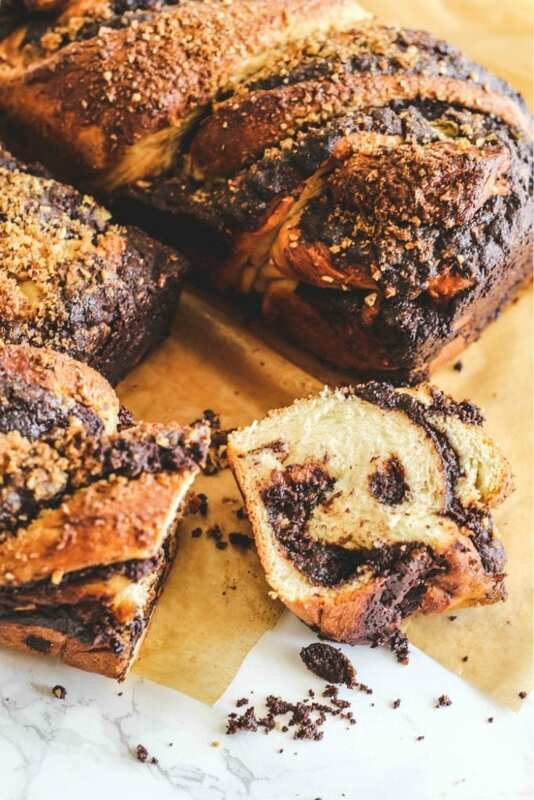 This babka is a soft and fluffy yeast dough just bursting with chocolate. It makes the most perfect breakfast with a hot cup of coffee or even dessert. It's a work of love and is a family favorite. Heat the milk (I used hazelnut milk) in a small saucepan over medium heat until it just begins to boil. Remove from heat and let stand until cooled to room temperature. Meanwhile, sprinkle the yeast over the warm water in a large bowl. Add 1 T of the sugar and let stand until foamy, about 5 minutes. Beat in the remaining 2 T sugar, eggs and margarine (or butter). Beat in cooled milk. Grease a large bowl. Place the dough in the bowl. Swish the dough around the oil so it's covered all over with oil. Cover with plastic wrap and place in a warm spot until doubled in size, about 1 1/2-2hours. Line 2 loaf pans with parchment paper. (or one regular size loaf pan and 4 mini ones. If you don't have a mini loaf pan, you can use a muffin tin) . Spray with baking spray. Making the filling: In a small bowl, whisk together the powdered sugar and cocoa powder. Stir in the melted margarine (or butter)and melted chocolate until it becomes spreadable; set aside. If you’re using the pecan topping, mix the ground pecans, sugar and cinnamon together in a small bowl; set aside. Punch down the dough. Dump the dough out onto a floured surface, roll out the dough into a 10-by-18-inch rectangle. 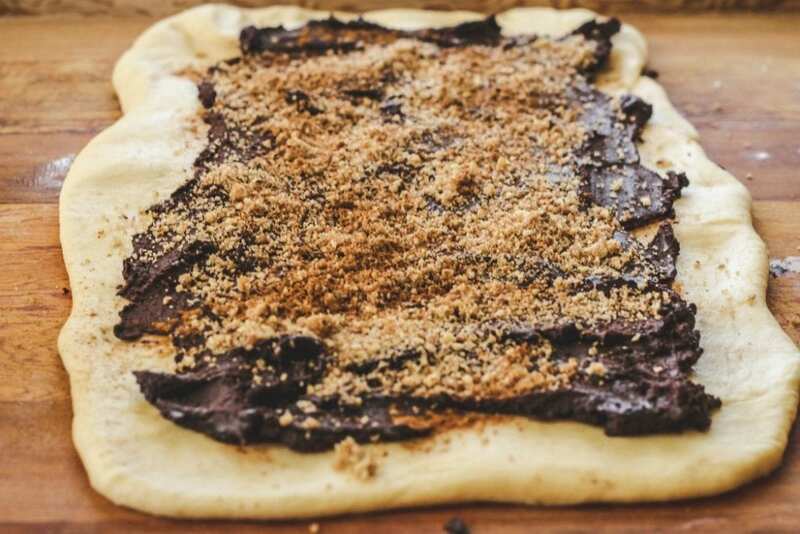 Spread the chocolate over the dough, leaving a 1-inch border on the sides. Sprinkle on pecan sugar mixture if using on top of the chocolate. Brush the borders with water. Tightly roll the dough into an 18-inch log, rolling toward the clean border; pinch the seam to seal. Cut the ends off. Place the ends in a muffin tin. Place roll seam-side down on the baking sheet. Cut the log in half so you now have two logs to work with. Cut the first half of the log in half lengthwise with a chef's knife. Twist the two halves together, crossing one over the other a few times. Pinch the end together, then tuck both pinched ends under the loaf slightly. Carefully place in the first parchment lined loaf pan. Repeat with the second log and place in the other parchment lined loaf pan (if you don't have two loaf pans, you could bake the other log on a parchment lined baking sheet or cut into smaller portions and place in mini loaf pans). Preheat the oven to 350 F. Cover the loaf loosely with plastic wrap and set aside in a warm place until plump, 30 minutes. Uncover the loaf and brush melted margarine (or butter) on the loaves. Bake the bread, rotating the baking sheet halfway through, until golden brown (a thermometer inserted into the middle should register 170 degrees F to 175 degrees F), 30-35 minutes. (check the rolls and mini loaves as they may be done a few minutes before). To melt margarine and chocolate, place them in a heat-proof bowl, and heat in the microwave in 20 second-intervals, stirring in between each interval, until melted and smooth (or alternatively, set it over a saucepan of simmering water, stirring occasionally). This looks SO pretty!! Love all the swirls! Wow, this looks amazing. A must try! OMG…AMAZING! 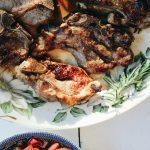 !My mom used to buy and make this when I was a kid, I was so craving it and came across this recipe and decided to try it – all I can say is WOW – tastes exactly how I remember! 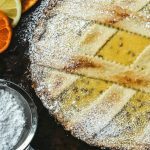 Really easy recipe to follow, thank you for putting it up! 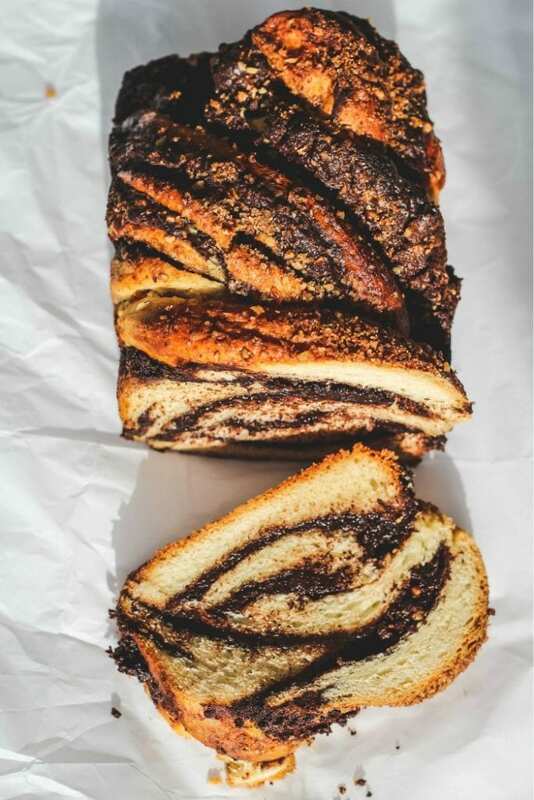 I would like to have one of these babka for tomorrow breakfast! Looks devine! I love this bread! It looks so good! 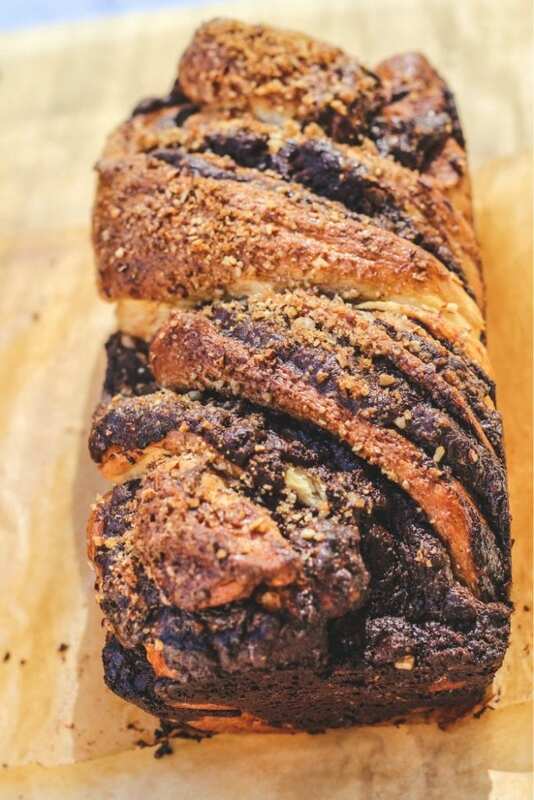 This babka looks scrumptious! I wish I had a slice right now!